This Picture Says It All – Dogs! I took this picture yesterday afternoon. First, the dogs look like they are about to get into a lot of trouble. Fred will pounce at a moment’s notice. Second, Kona is a cool dog. With Fuego’s (Kitty) death, my love for Kona grew. I finally saw her for who she truly is. 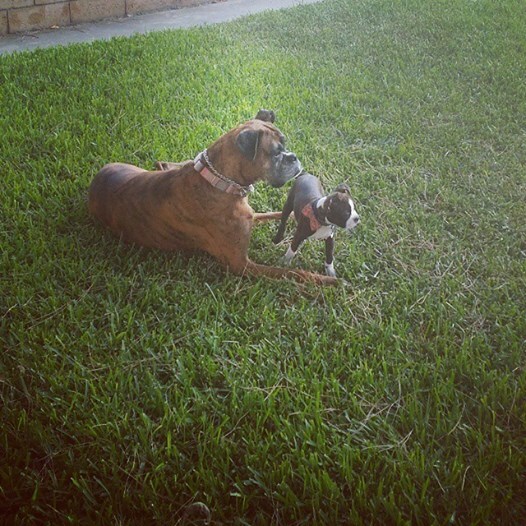 Finally, I get to see why Bostons get along with Boxers so well. 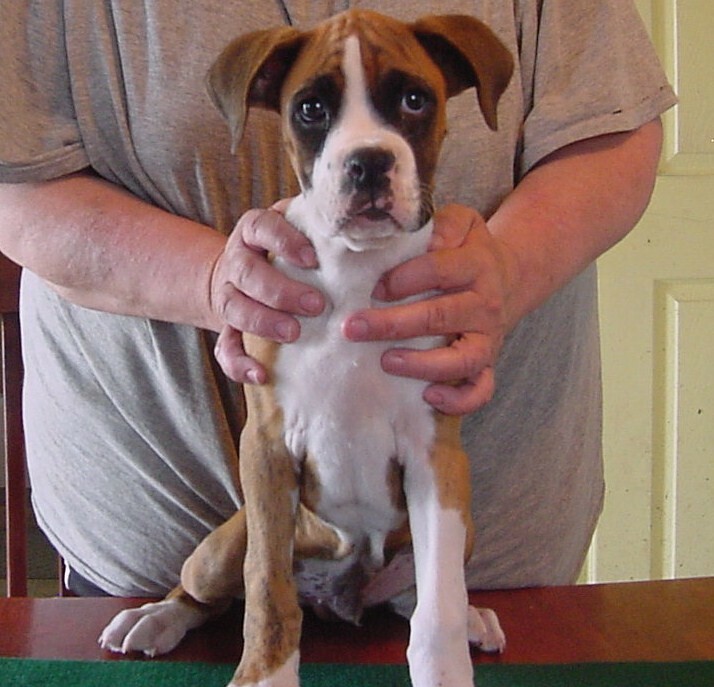 Despite of their small size (about a third of a Boxer when fully grown), they put up with the Boxers style of playing. Bostons can take Boxers on. It is so cute to see. Fred growls and sounds like Kona when he plays. It took a while for Fred to understand that Kona was trying not to kill him when she growled so loudly. But, perhaps, the biggest thing from this picture is what the dogs have taught me – coping with your disabilities to make the best of your situation. Kona has a bad back. It is riddled with arthritis. Getting up is a challenge. To a little puppy like Fred, Kona is just another dog. Kona could not keep up with the playing. So she lays down and they play together. Just two dogs (minus the running around). There is no pain for Kona. Fred doesn’t judge like humans do. The dogs make the most of their play time. It is so nice to see Kona enjoy Fred. If only we could learn to be more like dogs. I am sitting in front of my computer trying to figure out what to say about the death of my dog Fuego (A.K.A. Kitty). The words escape me. There is so much to say and very little comfort in writing about kitty. He is gone. There is no more KittyKatt (Kona and Fuego). The K family no longer owns two crazy boxers. Part of my identitiy is gone. Dogs are pure souls. Their default position is to love you unconditionally whether you are happy or down. If that does not work, they offer you more love. Fuego was the perfect example. He got me. We both had anxiety. I understood how he felt. We had our games like the evil sock, the paw, or the repent game. Rough housing with my big dog was fun. Just to think that I was scared of his size when FullEclipse and I picked him up from the breeder. 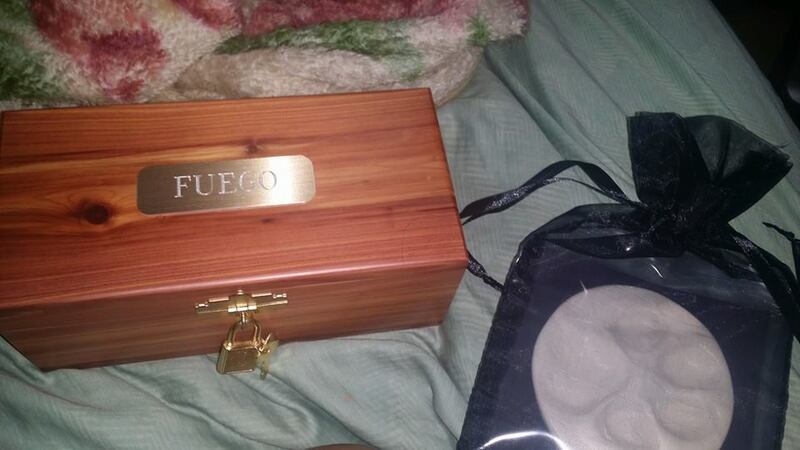 So if you were to ask me how I felt about Fuego’s death, I can honestly say that I am confused on how I feel and how I am coping with his death. Putting kitty down was a logical and financial decision that needed to be made for his well being. Thinking in terms of numbers makes me sick. Fuego deserved so much better. However, spending at least $1,400.00 for a surgery to remove his spleen gave us no warranties about his health. At best, he could live for six to nine months. But at what emotional cost? It was not fair for my energetic boy to live with a cancer that was spreading. I could have thrown all my savings at the problem only to get the same results. Fuego deserved better. I am also angry at the veterinarian for wanting us to spend money on keeping Fuego overnight for observation. The doctor only wanted to treat the symptoms. If it had not been for FullEclipse pushing for a solution, we would have spent $500.00 a day to give Fuego fluids – nothing more. To think that we could have decided to spend the money just to make Fuego suffer. It was until the doctor saw the tumor that he realized why we wanted to see what was making kitty so sick. He wanted us to bring Fuego home. We could not. Knowing he was dying was bad enough. Seeing him waste away was not an option. FullEclipse was there to say goodbye to kitty. I kissed him before he left for the veterinarian. Little did I know that would be my last kiss. Confusion also plays part in this equation. Fuego was fine. In fact, we had a photo session with one of my best friends. The dogs were happy. After my friend left, Fuego went downhill. My friend thinks that Fuego held long enough for her. I believe it too. It was surreal to see her cry. She told me she had a feeling this would be the last time she would see Fuego. 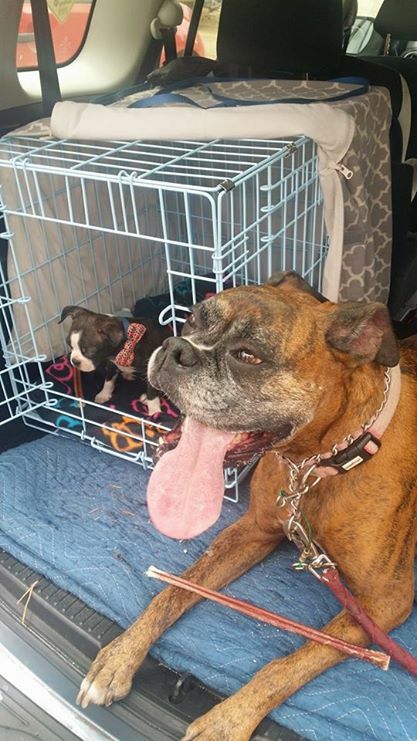 We now share the pain of losing two boxers. Not a fun club to join. I feel sick. My body has reacted in odd ways – from anger displacement to dry heaves. I have not felt great at all. The dry heaves began the night he died. Almost a week later and they have not stopped. Something inside is eating me. I also feel emotionally constipated (TM) because I have not been able to cry. The day Fuego was put down, I asked my parents to take the kids. For the first time in history, the kids did not want to hang out in my parents’ room. I had to eat my tears. I still do because K2 and Paczki (more than anyone) get upset if they see me cry. My emotions or lack thereof drove me to see Dr. Inception. Thankfully she was able to see get me in for a quick session. She told me it was okay to grieve on my own terms. The kids and FullEclipse have moved on. Paczki wants a new puppy to study why it is that large dogs die soon. It is her way of coping. We are thinking about getting a Boston Terrier. The thought stings. I miss you kitty! You were a tad stupid but made up for it with lots of love. R.I.P. Fuego Alexander Sweet Cheeks K, III. Be free and play with my Gimpy.